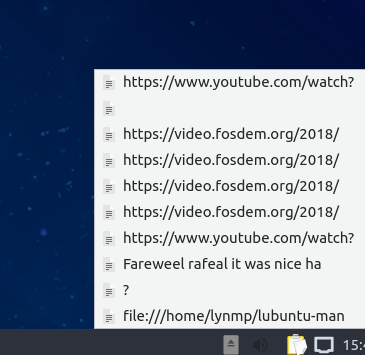 Qlipper is a clipboard manager that is included by default on Lubuntu. To use qlipper it is autostarted in the panel and click on the system tray icon that looks like a clipboard or you can press Control+Alt+v. If you really want an item to always show up right click on the clipboard and press the configure gear icon click on the sticky items divider and press the add button and add what you want always to be listed in qlipper. To change how many items get displayed in qlipper in total right click on qlipper and configure with the gear icon and change clipboard entries count to your desired number of entries. To change how many characters show up on qlipper from the same configuration screen change maximum display size. 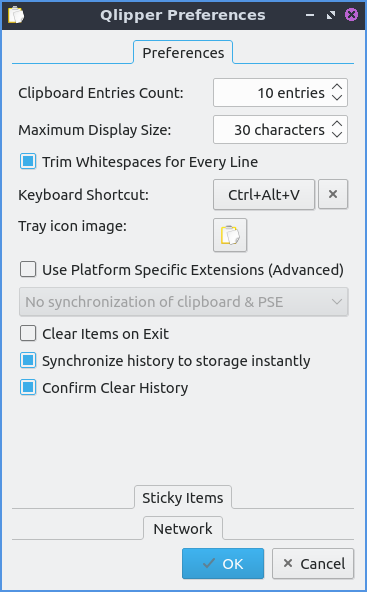 If you want to clear your clipboard history right click on the tray icon and Clear clipboard history. To change the tray icon image to something custom click on the tray icon right click on the tray icon Configure and then press the button next to Tray icon image which has an option to load a custom tray icon. Lubuntu ships with version 5.1.2 of Qlipper.